Price Reduced - Fall Special!! Call boat owner Todd at 419-490-5646 or Email Todd.Rains@utoledo.edu . Boat is in Toledo, Ohio. 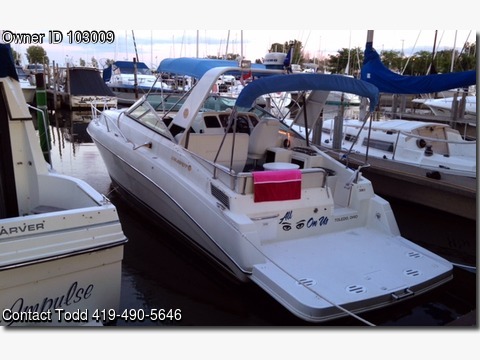 This Celebrity Cabin Cruiser is in great condition and has been meticulously cared for and maintained. Due to a NEW aftermarket swim platform, the LOA is 34' If you are in the market for a NICE cabin cruiser, look no further than this 1995 Celebrity 310 SC. ALL reasonable offers will be taken into consideration NO Low ballers please We are the third owner and have clear Title in hand along with entire history of service and maintenance records to show ONLY Reason for selling, family is upgrading to a larger boat. NOTE There is NO trailer. The cabin is VERY clean with original cushions and upholstery like new The vinyl seats are in good condition, no tears. Full Bimini camper top is in good shape. Equipped with twin ercruiser engines. The boat is currently stored in a heated storage facility in Toledo, Ohio. A MUST SEE NEW UPGRADES 2017 - Steel Anchor, chain and line 2016 - Mercruiser 5.7L long block engine Starboard Engine 2016 - New Water Pump replaced and Lower Drive Unit overhauled Starboard Engine 2016 - Norcold cabin refrigerator 2016 - Cockpit L-Seat vinyl reupholstered 2016 - Bottom Hull repainted 2015 - CD/USB AUX Boss Radio and Cabin and cockpit speakers 2015 - Aft Bilge Pump 2015 - 2 Deep-Cycle and Starter Batteries 2014 - New seals on both Lower Drive Units 2014 - New Bellows installed 2014 - Water Pumps replaced in both Lower Drive Units 2014 - Large Custom Swim Platform NICE Navigational Equipment - Furuno Dome Satellite - Brand New in box GPS/Chartplotter - Digital Antenna - Compass - Spotlight - VHF Radio NEW Electrical Systems -1 30 AMP, 125 Volt Inlet - 120-volt Electric Outlets -12 Volt DC power - 2 Deep-Cycle and Starter Batteries 2 Years Old - CD/USB AUX Boss Radio NEW - Cabin and cockpit speakers NEW - Generator Accommodations - Reverse AC/Heat - Pressurized Water System - Cockpit Wet Bar and Ice-Maker Deck Gear - Bimini Top - Mooring Cover poles -Anchor -6 Dock Bumpers Measurements LOA - 34' 0" Beam - 10' 5" Draft - 2' 11" Displacement - 8,700 lbs. Propulsion Engine Make - Twin 2 Mercruiser Engine Model - 5.7L Outdrives - Alpha Gen II Fuel Type - Gas Prop - 3-Blade Stainless Steel.